Related: here are the best horror games on PC. 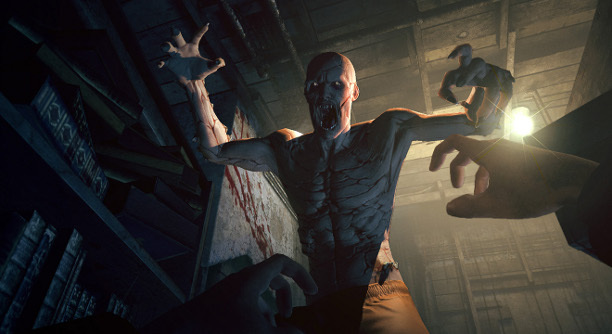 Outlast comes from Red Barrels, a small independent studio comprised of former Ubisoft and EA developers, among others. Morin himself worked at Ubisoft for a number of years (Sands of Time was one of his first major projects) until he and a number of colleagues moved to EA for a project that has since been cancelled. Now that they are on their own, with decades of AAA development experience between them, they are free to make what looks like a surprisingly polished, combat-free horror game. Outlast takes place in an abandoned insane asylum with ties to Cold War medical experimentation and government conspiracies, which have predictably ended in carnage and disaster. You play a photojournalist, Miles Upshur, who has arrived at the shuttered building at dusk to try and sneak in and uncover what the hell has been going on there for the past several years. 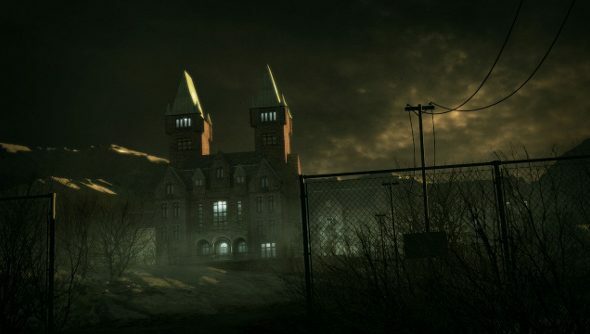 I’m aware that all sounds cliched (God help us, it’s called the Mount Massive Asylum), and Outlast’s use of familiar tropes is the one thing that left me concerned about its direction. No sooner have you broken into this run-down asylum for the criminally insane and government-funded neuropsychological experimentation than you start finding the usual grisly remains: the dead still sitting in their offices or in front of televisions, the butchered remains of a government commando unit, and severed heads collected on a shelf. I met a dying commando who told me, “He killed us all. You’ve got to get out of here.” Needless to say, you don’t. On the other hand, Outlast seems very good at employing these conventional elements of horror. It’s more about suspense than gore, and creeping through the dilapidated menace of the asylum set me up beautifully for the scares. Judging from the shrieks I heard through the curtain, the players at the other demo station were completely at the game’s mercy. 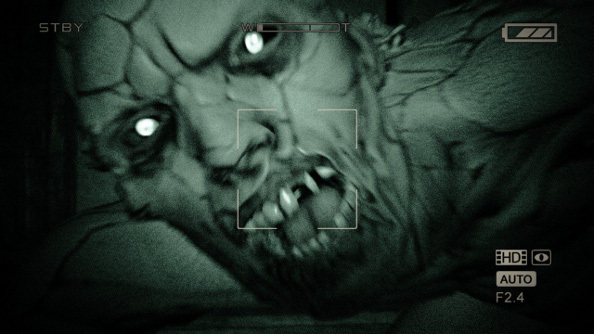 One particularly effective tool in Outlast’s arsenal is the digital camera that Miles carries, which has a night-vision mode that lets him see in the dark. The trade-off is that it has a narrow FOV, which is at once claustrophobic and slightly disorienting, and it’s CREEPY AS HELL. With night vision active, the frame is filled with digital noise and everything takes on a ghostly, murky quality. Except for eyes. That shelf full of severed heads I mentioned earlier? I didn’t notice it was there at first, because the light was too low and I was standing a few feet away, listening to an impaled commando give his final warning. Then I noticed a bunch of what looked like glittering gemstones hovering in the darkness. Getting closer, they resolved into eyeballs in rows of slack, dead faces. A few minutes later I met the author of this grisly scene, a horrifically scarred and mutilated giant of a man (think Soulblighter from the Myth games) who immediately started pursuing me through the building. It felt a bit like high-stakes parkour, except Miles is neither particularly fast nor particularly athletic. The best I could do was just try and get as many obstacles between me and the killer as I could, and hope an escape route appeared. Good luck with that. I didn’t have a very easy time of it, myself. I came to in a basement and, after gathering extra batteries for my camera, I set off for the surface once again. Unfortunately, no sooner had I found the door than the killer started smashing it down. I had scant seconds to hide, and ducked behind some shelves in an old janitor’s office just as the killer came pounding through, looking for blood. He didn’t see me and headed deeper into the basement. I sneaked through the door he’d left open and started making for the stairs. Just as I reached them, he appeared from nowhere and grabbed Miles by the throat. There was a ripping sound, some blood, and the screen went black. It was the end of the demo. I came away feeling a mix of hope and fear. The technical prowess on display was unquestionable, but I’m still bothered by the reliance on cliches. I asked Morin how Red Barrels are going to keep Outlast from getting stale, especially since most of us have seen more than our fair share of rooms covered in blood and corpse-tableaus. His response made me a bit more hopeful that Outlast will have more than just a creepy setting and a relentless bogeyman. He hinted that there are other parts of the asylum that will have very different emotional tones and art styles, as they reflect both that section’s original purpose and the way it has been twisted by its current inhabitants. Hopefully Red Barrels can surprise us a bit more in those other areas, and their creativity can catch up with their technical proficiency a bit. If they can get beyond some of the standard shock horror conventions they showcased in their brief PAX demo, Outlast could be another great addition to the genre when it comes out at the end of this summer.